Wow, okay. This weekend was a doozy of a hike. My goal was to “bag” both the Wittenberg and Cornell summits. Little did I know how strenuous it would be. The Wittenberg-Cornell-Slide Trail trailhead is located at the Woodland Valley campground, so I decided to set up base camp at the campground. That way I could do a dayhike on Saturday and return to an already set up tent. I did my usual leave-after-work-on-Friday trip and arrived at the campground well into pitch black (the sun is going down sooner and sooner these days). I set up by the light of my headlamp and tucked in for what was to be a chilly night. 7:30 am the next morning, I was up and on the trail. Just the initial hike to the Register Box winded me. It couldn’t get harder than this, right? Well, upon reaching the first boulder I had to vertically climb up, I knew that I was in for some serious hiking. This was a tough hike with lots of bouldering required and even a rock “crack” to shimmy up. I came upon three separate hikers who had harnesses hooked up to their dogs in order to raise and lower them. All in all, this was a very tough hike. I’m glad that I only had a five pound daypack and not a 25 pound backpack. The hike began at 1,400 feet and ascended to 3,800 feet, an elevation gain of 2,400 feet to get to the top of Wittenberg Mountain. Hard work but let me tell you, the view was breathtaking. The exhaustion I felt immediately washed away. Hopping over to the summit of Cornell Mountain required some more exertion but went by fairly quickly. Cornell had some nice views also but not as panoramic as Wittenberg. I did, however, make a couple new friends. I met Dan and Jen, fellow Catskill 3500ers, and tagged along with them on the loooong, rocky descent back to the campground. Yeah, #3 and #4 of my Catskill 3500 peaks. Enjoy the photos. Establishing base camp at the DEC’s Woodland Valley Campground. My BMW R1200GS and Hilleberg Unna remained onsite for two days while I went off to bag both Wittenberg and Cornell summits. If you don’t want to camp, there is an overnight parking lot at the trailhead of the red-blazed Wittenberg-Cornell-Slide hiking trail in the Catskill Mountains. The 7:30am sunlight filtering through the trees as I hop on to the red-blazed trailhead from the end of Woodland Valley campground. This will lead straight over the summits of Wittenberg Mountain and Cornell Mountain (and Slide also). Just getting to the register box was a chore. I didn’t know it at the time but this definitely served as a forewarning as to what to expect. Don’t get too close to the edge. Hiking along the red-blazed Wittenberg-Cornell-Slide trail in the Catskill Mountains. A glimpse through the trees while hiking along the red-blazed Wittenberg-Cornell-Slide trail in the Catskill Mountains. The first bouldering event. Approximately half way up or so, it suddenly became obvious that this hike to the summit of Wittenberg Mountain was going to get harder. You’ve got to be kidding. The challenge of the Catskill Mountain’s Wittenberg-Cornell-Slide trail just raised a notch. Oh yeah, this is why I just beat up my body for four miles and 2,400 feet of elevation gain – the spectacular view from the summit from Wittenberg Mountain. Obviously, a popular destination in the Catskill Mountains. Heading over now to the summit of Cornell Mountain. Yep, more Catskill bouldering. The infamous Cornell Crack in the Catskill Mountains. This picture doesn’t do it justice. It’s much more intimidating in person but if you’re the least bit athletic, you can shimmy up it though having a spotter might help. 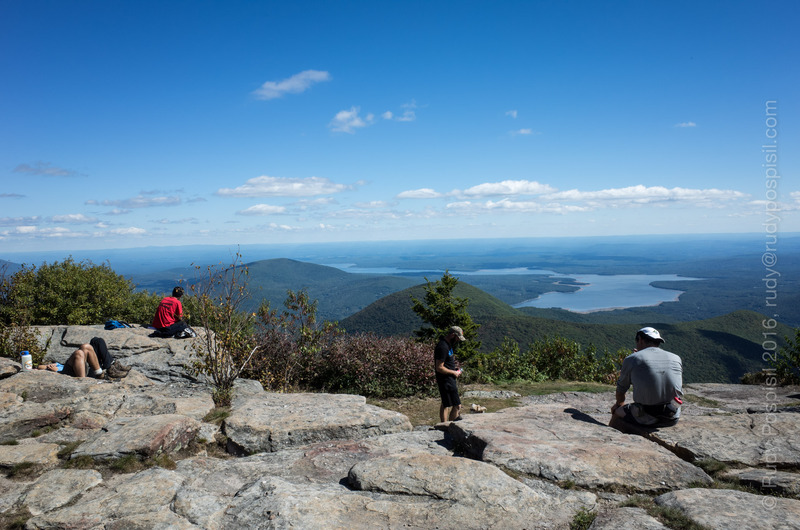 Panorama shot from the summit of Cornell Mountain, one of the 3500 of the Catskill Mountains in New York. That’s Wittenberg Mountain in the middle, about 0.8 miles away and where I just came from. Heading back to the Woodland Valley base camp in the Catskill Mountains. It’s a long five mile descent. Checking out at the register box on the red-blazed Wittenberg-Cornell-Slide trail in the Catskill Mountains. Such a beautiful sight! At this point, my leg muscles were mush and my shoulders were sore from the trekking poles. Passing Steve Heller’s Fabulous Furniture in Boiceville, NY as I leave the Catskill Mountains and ride the 2 1/2 hours back to Manhattan. Google Earth showing my roundtrip dayhike from the Woodland Valley DEC campground to the summits of Wittenberg Mountain and Cornell Mountain. The elevation graph from my Garmin Montana GPS showing the ascent from the Woodland Valley DEC campground to the summits of Wittenberg Mountain and Cornell Mountain. Time for Catskill peak #2. This weekend, my plan was to hike to the summit of Panther Mountain and camp overnight at the primitive camp by Giant Ledge. I left work on Friday around 5:15pm and rode my trusty BMW R1200GS up to the NY DEC’s Woodland Valley campground in Phoenicia, NY. I arrived at 7:45pm, checked in, and set up in the dark. The Hilleberg Unna coupled with my red LED headlamp made for very easy pitching. Sleep came easy but so did the cold. It dropped to 50¨ degrees overnight and made for a chilly slumber. Arriving at the DEC’s Woodland Valley campground in Phoenicia, NY after dark. Luckily the rangers are there till 9:00pm. Up bright and early the next morning, I packed up and rode over to the Giant Ledge trailhead. Here I would park overnight while I backpacked up to Panther Mountain and back. Breaking down the Hillleberg Unna to leave the Woodland Valley campground and ride over to the trailhead to ascend Panther Mountain. Woodland Valley is one of the stranger campgrounds in that many of the sites are set up right along side the road. My guess is that they didn’t have a lot of land to work with and they had to shoehorn in the sites. If you have kids, you’ll want to keep an eye on them so they don’t run out into the traffic. Embarking on the trailhead of the yellow-blazed Phoenicia East Branch trail in the Slide Mountain Wilderness area of the Catskill Mountains. Much of the Phoenicia East Branch trail in the Catskill Mountains is an incline of rocks. Coming up on the blue-blazed Giant Ledge-Panther-Fox Hollow trail in the Catskill Mountains. That looks like a bear paw print. Bear spray? Check. A water spring is marked on the Giant Ledge-Panther-Fox Hollow trail but all I could find was a puddle of collected water. Perhaps it had dried up. This was to be a refill spot for me but now I’ll have to ration. Taking a break on Giant Ledge on the Giant Ledge-Panther-Fox Hollow trail on my way to the summit of Panther Mountain in the Catskill Mountains. Scenes from Giant Ledge on the Giant Ledge-Panther-Fox Hollow trail in the Catskill Mountains. Seeing the 3500 ft elevation mark is a glorious experience. I’m almost to the summit of Panther Mountain. Feets, don’t fail me now. YES! Reaching the summit of Panther Mountain in the Catskill Mountains in NY. Poor pup, being treated like a pack mule. He actually seemed very happy carrying his own load. One final view from Giant Ledge before hitting the primitive camp area. Setting up the Hilleberg Unna in the primitive camp area by Giant Ledge in the Catskill Mountains. There is lots of splendid, soft ground to set up on. It rained and blustered all night. 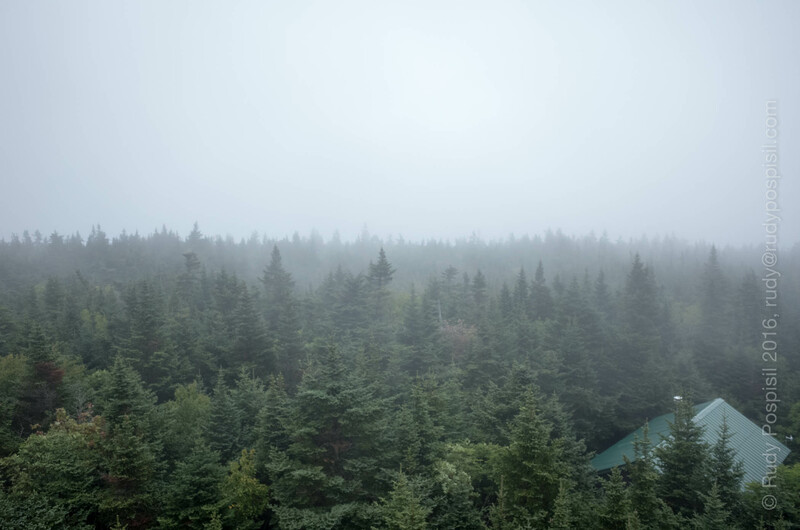 I woke up to a mist-filled forest in the Catskill Mountains primitive camp. Retrieving my hung bear bag in the misty morning. Nothing but a fog-filled view from Giant Ledge on Sunday morning. Fortunately I was sated from all the stunning views the day before. Arriving at the overnight parking lot for Giant Ledge, my trusty BMW R1200GS safe and sound, ready to take me back home to Manhattan. Google Earth showing my roundtrip backpacking hike from the Phoenicia East Branch trailhead to Giant Ledge to the summit of Panther Mountain and back again. The elevation graph from my Garmin Montana GPS showing the ascent from the Giant Ledge parking lot to the summit of Panther Mountain. After dipping my toes last weekend in the Catskill Mountains, I had to go back again this weekend, this time for something a little more challenging. I loaded up the overnight backpack (base weight – 22 lbs/10 kilos) Thursday night. My plan was to take off directly from work on Friday. I reserved a Friday night spot at one of the “remote” hike-in sites at the DEC’s Little Pond campground. 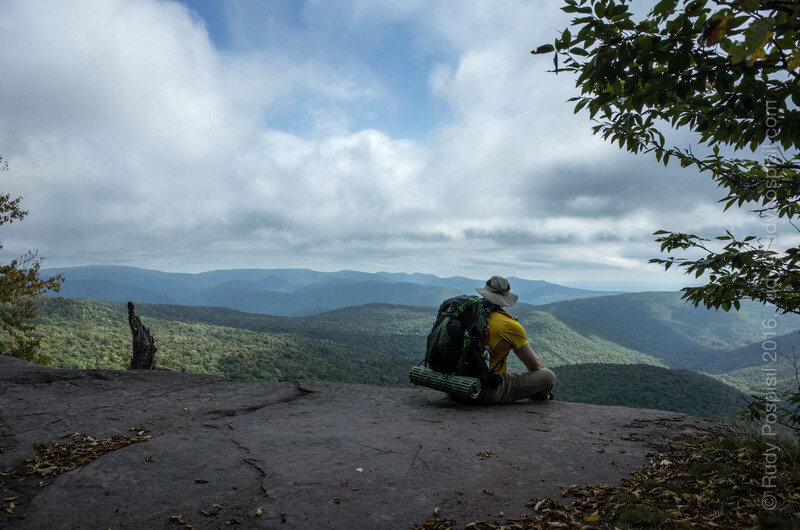 From there, the next morning, I would ride to the overnight trailhead lot for Balsam Lake Mountain, backpack up to the peak, camp overnight at the lean-to, and then hike back down to the bike on Sunday and ride back to NYC, ready for a new work week. Aside from having to suffer the miserable 17 leaving New Jersey, the ride up was uneventful. I arrived at Little Pond before dark, hiked in a lengthy 0.1 mile, and set up camp right on the shore. The remote sites are brilliant in this regard. None of the drive-in sites allow this sort of access. It’s a beautiful sight to wake up and look directly out across a pristine body of water. Setting up the Hilleberg Unna right at the shore at DEC Little Pond Campground in the Catskill Mountain region. Parking the BMW R1200GS in the southern access lot for the Dry Brook trailhead and juncture of the Neversink-Hardenburgh trailhead in the Balsam Lake Mountain Wild Forest in the Catskill Mountains. The first leg on the yellow-blazed Dry Brook Ridge trail was fairly easy, a very gradual incline. At the 0.9 mile mark, I veered onto the blue-blazed Balsam Lake trail. The ascent instantly became steeper, running from 2,900 feet up to 3,650 feet over the next 0.6 miles, a grade incline of 24%. The final 1/4 mile to the peak allowed for a much needed respite as it covered the final 73 feet or so, an almost level incline compared to what came right before it. The blue-blazed Dry Brook Ridge trailhead. As always, don’t forget to register in/out when hiking. Veering onto the red-blazed Balsam Lake trail in the Catskill Mountains. Here’s where the fun begins. The next 0.6 miles is STEEP. 1. Passing the 3,500 foot elevation marker. Boy, did that cause a surge of happy juice. 2. Drinking from a natural spring at 3,600 feet. Wow, was it cold and delicious. 3. Seeing the base of the Balsam Lake Mountain fire tower through the trees. What a rush! Hitting the 3,500 ft mark of Balsam Lake Mountain in the Catskills. I think I might just have to sign up with the Catskill 3500 Club. Natural cold, fresh spring water at 3,600 feet on Balsam Lake Mountain is INCREDIBLE. It, alone, is worth the journey. I’ve hit the peak. The Catskill’s Balsam Lake Mountain fire tower can be seen through the trees. I was briefly disappointed that there was no view from the summit, however the fire tower was open. Unfortunately, my timing couldn’t have been worse. The day was overcast and peak was enveloped in misty clouds. I was escorted up into the cab by a volunteer but, as you can see in the photos, I wasn’t able to see beyond a few hundred feet. Bad timing. The peak of Balsam Lake Mountain is enshrouded in clouds. I’m missing out on beautiful panoramic views. That’s the ranger’s station at the bottom right. Inside the Balsam Lake Mountain fire tower. The painting cruelly lets me know what I’m missing. Jessica, a Balsam Lake Mountain fire tower volunteer (and who, in an incredible feat of “small world”, lives 15 blocks from me in Manhattan), explains how the fire watchers would use this map to help triangulate exactly where a fire was located. Your host, catching his breath, in the Catskill Mountains’ Balsam Lake Mountain fire tower, approximately 3,770 feet above sea level. Heading back down, I stopped by the lean-to. I was planning on camping out here for the night but I was warned that a major thunderstorm was expected and I didn’t feel experienced enough to hike back down a steep incline the next day on slippery rocks the entire way. Call me a woose. The Balsam Lake Mountain lean-to. I was planning on camping out here for the night but I was warned that a major thunderstorm was expected and I didn’t feel experienced enough to hike back down a steep incline on slippery rocks the entire way. Well, my first Catskill 3500. It was exhilarating, to say the least. I’m going to have to look into Catskill 3500 membership, a much worthier accomplishment than completing a Bernie’s Bagels/Distillery Passport of round-the-world beers. The elevation graph from my Garmin GPS showing the ascent of Balsam Lake Mountain from the blue-blazed Dry Brook Ridge trailhead in the Catskill Mountains. You’ll notice a deviation east to the Black Brook along the Neversink-Hardenburgh trail where I started off on the wrong path. The elevation graph from my Garmin GPS showing the ascent of Balsam Lake Mountain from the blue-blazed Dry Brook Ridge trailhead in the Catskill Mountains.